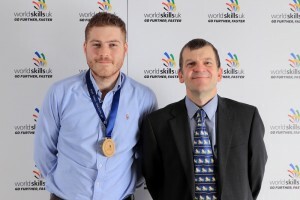 23-year old Rhys Boni has been crowned 2018 SkillELECTRIC champion after excelling in an intensive two-day practical competition at WorldSkills UK LIVE – the nation’s largest skills and careers event with over 80,000 visitors. The task had to be completed within a strict timeframe and was marked against tough criteria including wiring and connection skills, inspection and testing and measuring and marking out, which had to be accurate within + / – 2mm. All finalists that took part received a two-channel HD CCTV kit from ESP, a professional safe isolation kit from Di-Log, an ECIR Codebreakers guide from NAPIT and a goody bag including a power bank from Unite the Union. The winning college also received £500 worth of products from Scolmore Group.